Don't spend hours of your time searching the web for the lowest airfare and accommodation prices. Use Webjet to find holiday package deals to Auckland and select the best one for your budget. Hassle-free Experience: Let an experienced travel agent arrange all your flights and accommodation for your trip. Save Time: Say goodbye to spending hours online searching for the best deal. Our experts do all the research for you. World-class Service on a Budget: By purchasing a holiday package deal to Auckland, you can take advantage of the travel industry's competitive nature and stay in some of the city's top hotels for less. No hidden costs: You'll pay for all your flights and accommodation before you leave so there aren't any surprise costs when you arrive in Auckland. Auckland Sky Tower is the city's highest building. It's the best place to go if you're searching for the perfect spot to take a picture of the metropolis below. There is a 192-metre observation desk that can be reached with a glass elevator, and if you visit on a clear day, the views stretch for as far as 80km. Waiheke Island is one of Auckland's most popular day trips. 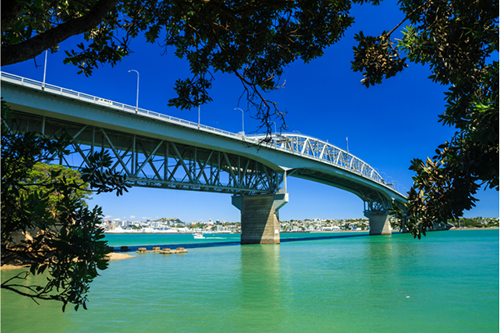 A natural addition to your itinerary once you've booked one of Webjet's Auckland holiday deals. You can catch a ferry from the Princes Wharf, and in 35 minutes you'll be exploring the art galleries, cafes and the island's beautiful white sand beaches. For nature lovers, there are plenty of trails along the coastline and through the forest. Try the Church Bay Circuit for spectacular views or visit the Stony Batter Historic Reserve and explore the underground tunnel from World War II. Auckland's Aquarium is a top attraction for travelling families. The massive aquarium is home to tunnel walkways, an Antarctic Encounter gallery and plenty of marine life. If you're feeling brave, you can sign up for one of the Shark Dive or Shark Cage Snorkel experiences. Head to Auckland's east coast if you want to spend an afternoon relaxing on the beach. Takapuna Beach is one of the most popular spots while Milford Beach tends to be less crowded. But if you really want a strip of sand to yourself, take a short drive out of the city. Maraetai Beach has calm waters, perfect for families with little ones in Auckland on Webjet travel deals. Built in 1887, the Auckland Art Gallery is one of the most impressive cultural sites in the city. It houses an extensive collection consisting of more than 15,000 works of art from European and local artists. Some of its most interesting exhibitions are the ones that highlight Maori and Pacific Island artists. There isn't a tipping culture in New Zealand. However, if you think the service was exceptional, you're welcome to leave behind a small tip. Freedom camping is a thing in New Zealand. If you have a campervan, you can camp on any piece of conservation land free of charge. The best time to visit Auckland with Webjet travel deals is during its two shoulder seasons. From March to May and September to November, you'll find fewer crowds, pleasant weather and favourable hotel rates. Use the Link buses to get around the city. It's cheap and an efficient way to see Auckland's top attractions. Fares cost between NZD 1 to NZD 5.50, and the service runs every day from 6:30 a.m. to 11:30 p.m.
Get online at one of the free WiFi spots. The service is available to all users for 30-minutes per day, per device at select public spaces and council-owned facilities.